High in fiber, low in fat, and completely adaptable to your taste, this soup is great for all seasons. Serve as an entree for a healthy, satisfying meal that comes together quickly for an easy weeknight meal. 1. In a large pot, heat oil over medium-high heat. Add onion, carrots, and celery to the pot, season with salt and pepper, and saute until tender, about 5-7 minutes. 2. 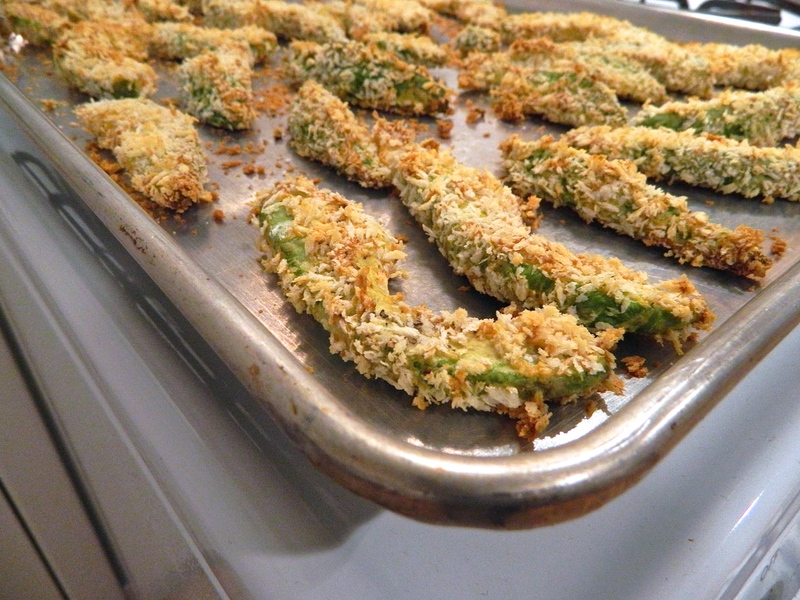 Add garlic and jalapeno and cook for another minute. 3. Stir in tomato paste, cumin, and smoked paprika and cook for another 2-3 minutes. 4. Deglaze the pan with wine, scraping the bottom of the pot to loosen any stuck-on bits; reduce by half. 5. Add tomatoes, chicken broth, 1 cup water, beans, bay leaf, and thyme; bring to a boil, reduce to simmer and cook for 30 minutes, stirring occasionally. 6. Remove bay leaf and thyme and roughly puree with an immersion blender or regular blender (it should still be very chunky; alternately, you could eliminate this step completely and leave it as is). 7. Adjust seasoning and serve with cilantro (or parsley), avocado, lime juice, and yogurt (all optional). Initially posted without a photo on account of a stolen phone, photo below was retrieved from the magical cloud! 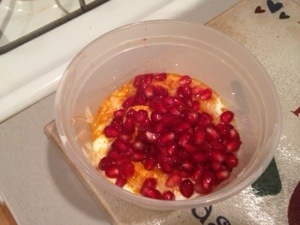 Here we have plain Greek yogurt dusted with turmeric, drizzled with honey, and garnished with pomegranate arils. Don’t forget it, because it’s f#@&! *$ delicious. 1. Heat oil in a pot over medium heat and then add onion, celery, and carrots. Season with salt and pepper and saute, stirring occasionally, until the vegetables begin to soften, about 6-8 minutes. 2. Add garlic and cook for about 1 minute, or until fragrant. 3. Stir in tomato paste, cumin, chili powder, and cayenne pepper and cook for about 2 minutes, stirring often. 4. Pour broth into the pot and stir, scraping the bottom of the pot to loosen any bits. 5. Add the lentils to the pot. 6. Bring to a boil, reduce to a simmer, and cook for 20-30 minutes, or until the lentils are cooked through. 7. Adjust seasoning to taste and serve with garnish options of your choice, depending on taste and whether you are making the soup vegan. Serve with whole wheat naan or pita bread and you’ll feed 3 hungry or 4 normal(ish) people. The best part about this recipe? It gets even better as it sits. Make plenty so that you have leftovers throughout the week. 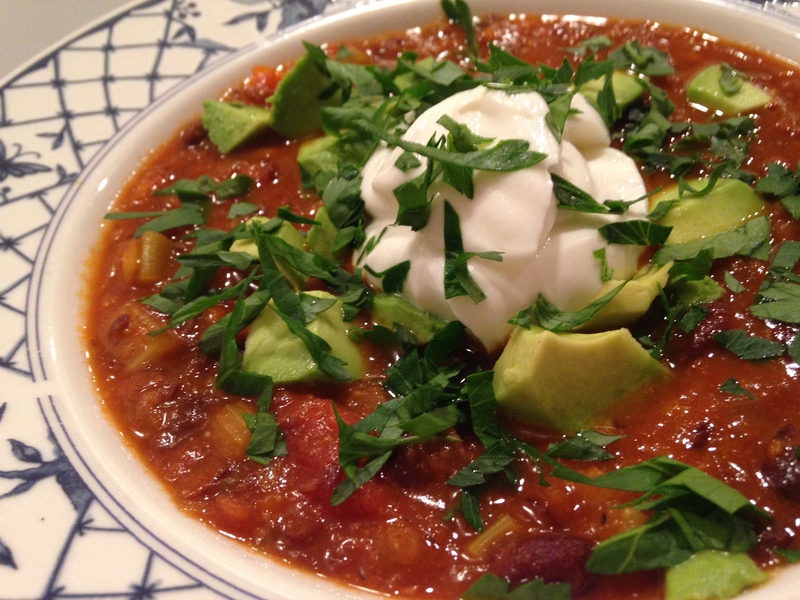 I know that you’re supposed to have soup when you’re sick, but after trying this–gulp–vegetarian chili, it hit the spot. Maybe I still feel like $#!+, but at least I had a taste of comfort food, and all I had to do was a little prep work the night before, and turn the slow cooker on in the morning. 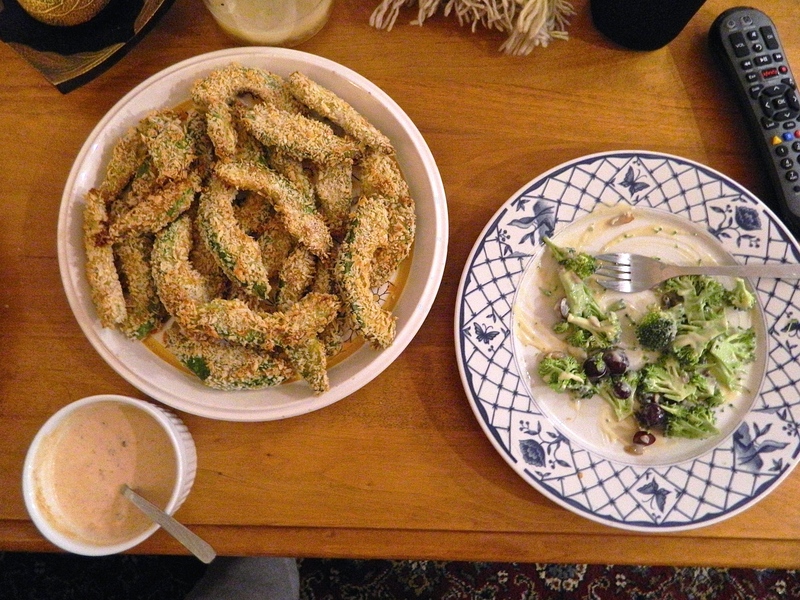 You can find the recipe here, on the Real Simple website. 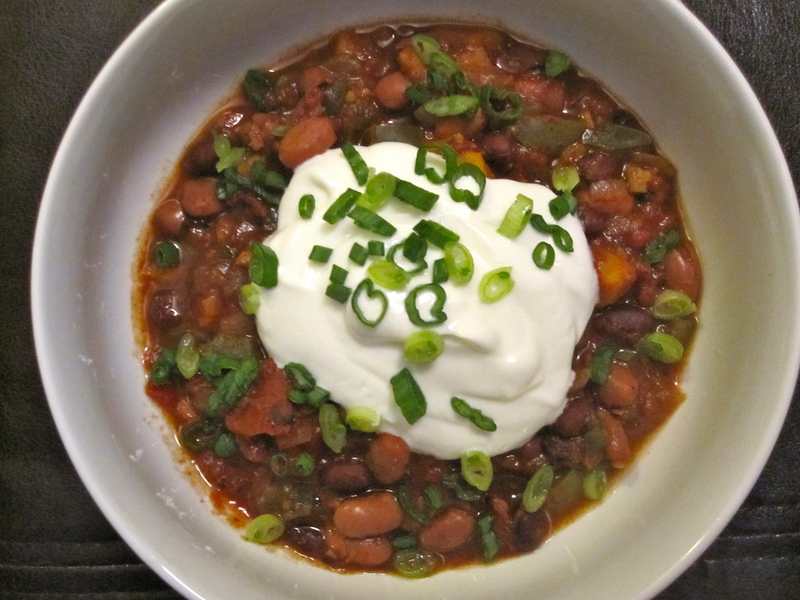 Take the opportunity to actually enjoy this meatless chili; I’m not saying it’s better than a beefy variety, but it’s damn tasty. *Please note: when I am sick, there is little motivation for me to eat in my underwear; however, once I recover, I’ll be stripping down to enjoy this little number. And I won’t feel guilty after polishing off a bowl (or two). A birthday celebration with my best friends from high school usually involves a high level of ethanol and specific foods fit for eating after a night of dancing and drinking. These foods are generally rich in saturated fats that plagues you with great guilt the next day. Keeping this in mind, I made one of my best friends’ favorites to satisfy our cravings and alleviate some of the morning-after shame: French onion dip. 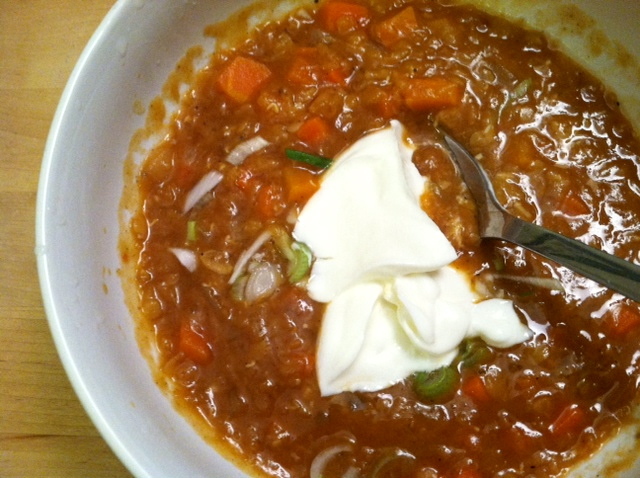 This recipe replaces the sour cream with non-fat plain Greek yogurt, retaining creaminess and cutting much of the fat. 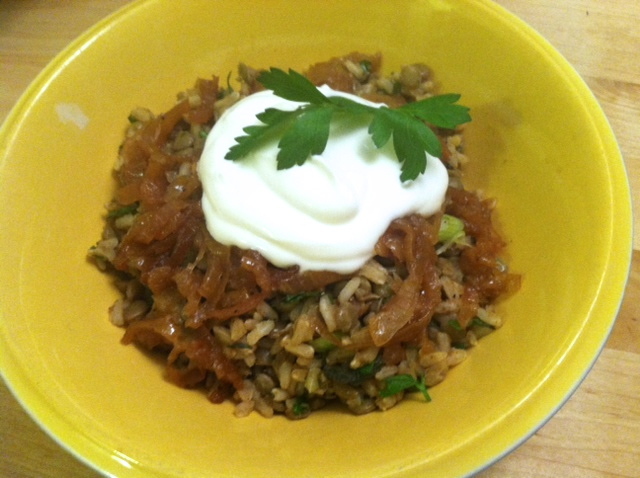 Caramelize sliced onions in oil and season with S & P. During the last minute of cooking, add minced garlic. Remove from the pan and cool. 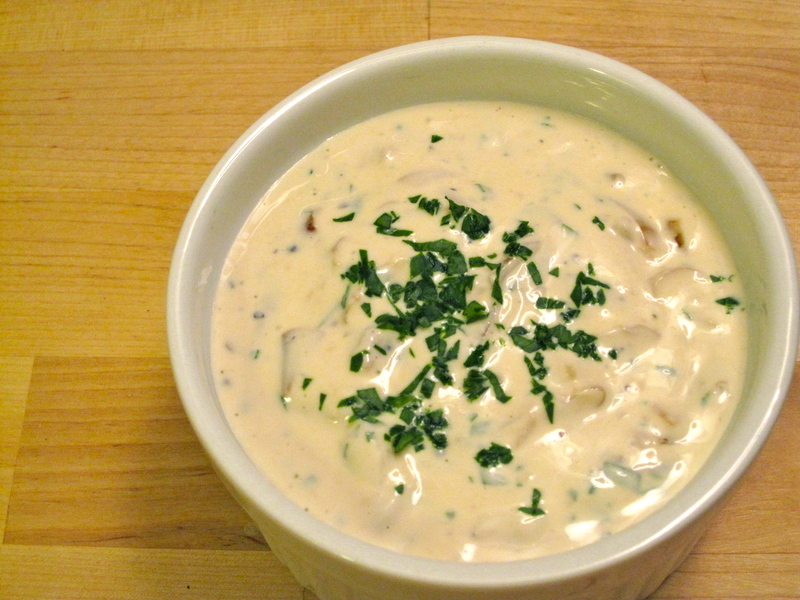 Once the onions have come to room temperature, combine with mayonnaise, yogurt and chopped fresh parsley. Season with lemon juice and S & P, to taste. Refrigerate for at least two hours or overnight. This dip gets better with time, and you’d never notice that it contains half the fat of traditional French onion dip. So whether or not you eat these in your underwear, your booty will thank you in the morning.